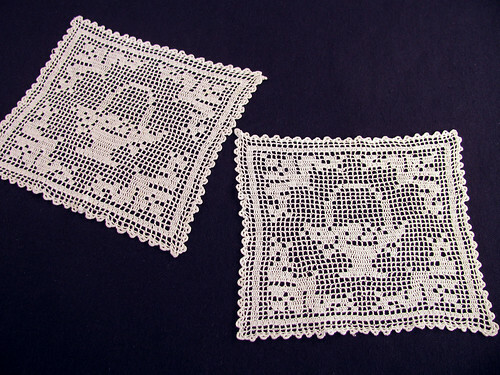 I found these two 5″ squares of filet crochet lace at my grandmothers. I do not think my grandmother made these. She liked to read more than do needlework. They are made with size 100 thread and a fine gauge hook. The pattern is simple and rather charming It is hard to describe in words how light and delicate they are to hold. This entry was posted on Tuesday, March 10th, 2009 at 6:02 pm and is filed under Crochet, Doily, Lace and Vintage. Tagged: Crochet, Doily, Lace, Thread. You can feed this entry. You can leave a response, or trackback from your own site. They look absolutely precious! What a fabulous find! Are you going to frame them or put them on a pillow??? I look forward to seeing what you end up doing with them.